Dr. Barbara Steinberg offers her pearls of wisdom on the most current information covering a potpourri of oral health and medical issues affecting women of all ages. Pregnancy, lactation, intimate partner violence, eating disorders, menopause, heart disease and osteoporosis are some of the issues to be considered. This promises to be an informative and high-energy course with time allocated for audience discussion. Unregistered participants will be assessed a $35 walk-in fee. We aim to accommodate walk-in registrations for all programs; although lecture room and/or hands-on training space is limited. Pre-registration is suggested to guarantee your space. Barbara J. Steinberg, DDS, earned a dental degree from the University of Maryland School of Dentistry and completed a residency at the Medical College of Pennsylvania. She is a clinical professor of surgery at Drexel University College of Medicine, as well as an adjunct associate professor of oral medicine at the University of Pennsylvania School of Dental Medicine. She is a diplomate of the American Board of Oral Medicine. Specializing in the treatment of medically compromised patients, Dr. Steinberg is a former spokesperson for the American Dental Association on women’s oral health issues and has had numerous television appearances, including Good Morning America. She represented the ADA at a congressional briefing on women’s oral health issues and presently serves on the Health, Nutrition and Fitness Board of Woman’s Day magazine. She is an internationally invited lecturer in the areas of dental treatment of the medically compromised patient and women’s health. She has also authored numerous articles and contributed to major textbooks on these subjects. UTHealth School of Dentistry PACE Center is designated as a recognized provider of the Commission for Continuing Education Recognition Program (CERP) conducted under the auspices of the American Dental Association. Individuals should consult with their state board regarding recognition of courses accepted for re-licensure. 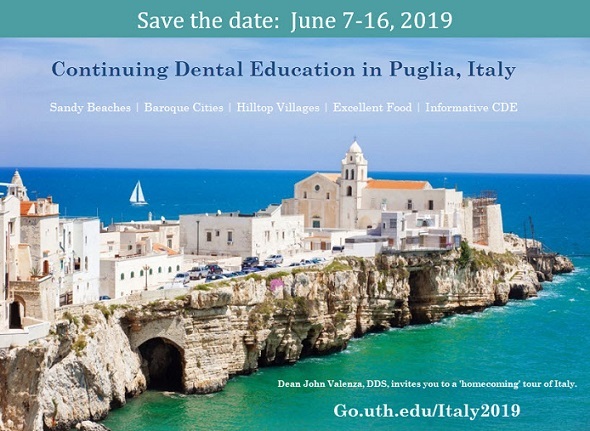 The formal continuing dental education program of this sponsor is accepted by the AGD PACE Program for Fellowship/Mastership credit. The current term of acceptance extends from November 1, 2015 to December 31, 2019. UTHealth School of Dentistry PACE Center is a member of the Association for Continuing Dental Education. 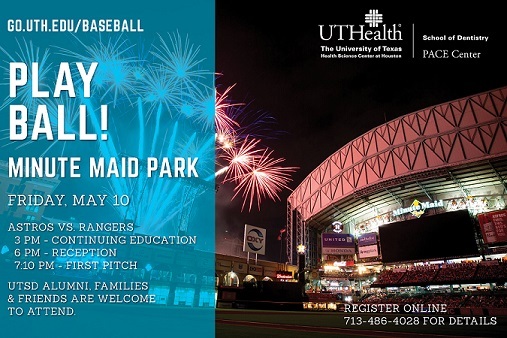 Upon registering in any continuing education activity, the participant agrees that The UTHealth School of Dentistry at Houston and their affiliates, and all personnel associated with the program are not responsible or liable for any injuries or other damages sustained by the attendee in connection with the scheduled activity, and the participant hereby releases each of them from any claims against them arising directly or indirectly from any such injury or damage. The registered participant grants permission to the PACE Center, Continuing Dental Education (and its designees and agents) to utilize the participants’ image, likeness, actions and/or statements in any live or recorded audio, video, or photographic display or other transmission, exhibition, publication, or reproduction made of, about, or at, the activity without further authorization or compensation. Participants may not use video or audio recording devices during the course or scheduled event. Registering for any continuing education activity constitutes acceptance of these terms. Policy applies towards all registrations processed. Full tuition must accompany registration to ensure participant’s space in a course. Participant's registration may be cancelled if tuition is not received prior to course date. Tuition is completely refundable if a course is cancelled by the PACE Center, Continuing Dental Education or if the registrant cancels more than 21 working days prior to a course. Registrants who cancel 10-20 working days prior to a course may apply the entire fee towards another course or receive a 50% refund. A $75 administrative fee will be charged for registrants who cancel 10 working days prior to the course or who notify us the day of the course that they are unable to attend. No refunds will be given for cancellations made less than 5 working days prior to a course, but tuition (less $75 administrative fee) may be applied toward a future course. “No Shows” for a course will forfeit the full tuition. Specific courses have a set deadline required to register and cancel for each course. Registrations and cancellations will not be accepted after the set deadlines for these courses. Please see the individual courses for the deadlines. Cancellation notice must be submitted by mail, email or fax (713-486-4037) for appropriate refund and/or credit (if applicable). The PACE Center, Continuing Dental Education cannot be held responsible for a non-refundable airline ticket in the event of course cancellation.